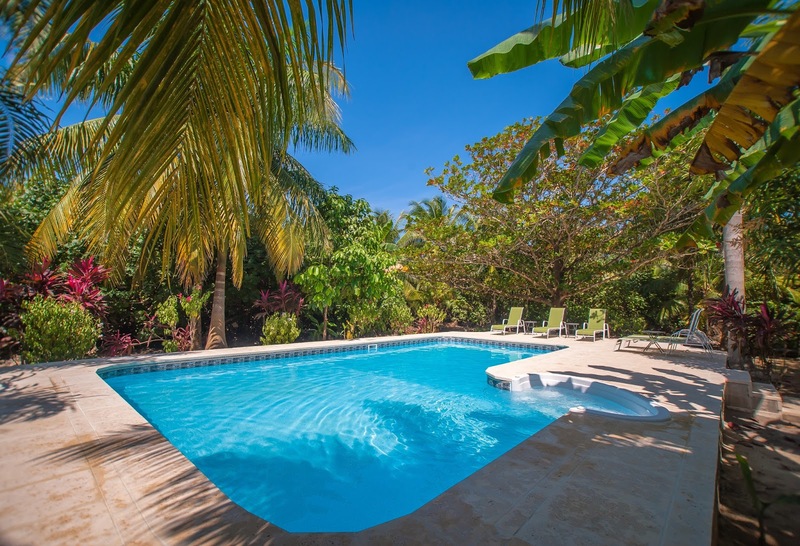 As you know, we recently bought a beautiful 3 bedroom, 2 bathroom Bali inspired villa on the beautiful Caribbean island of Roatan. 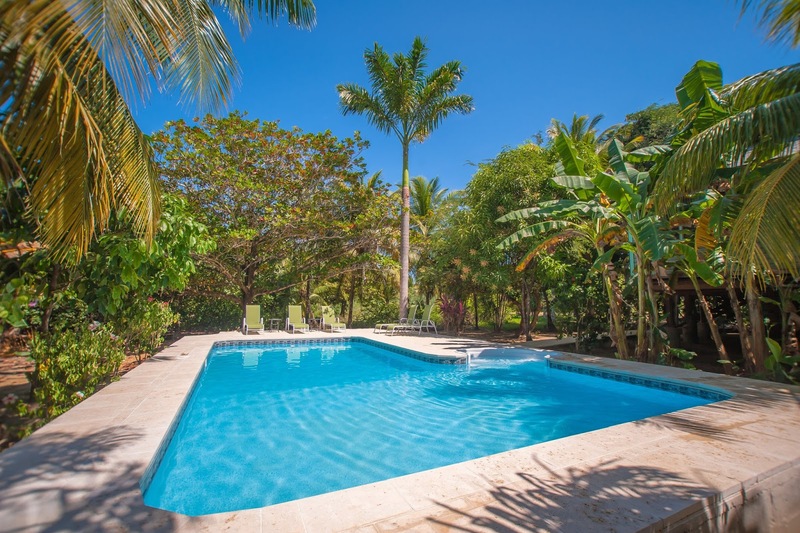 The villa, at the Resort at Palmetto Bay, sits on 2/3 acre of lush tropical gardens and is just steps from the beach. 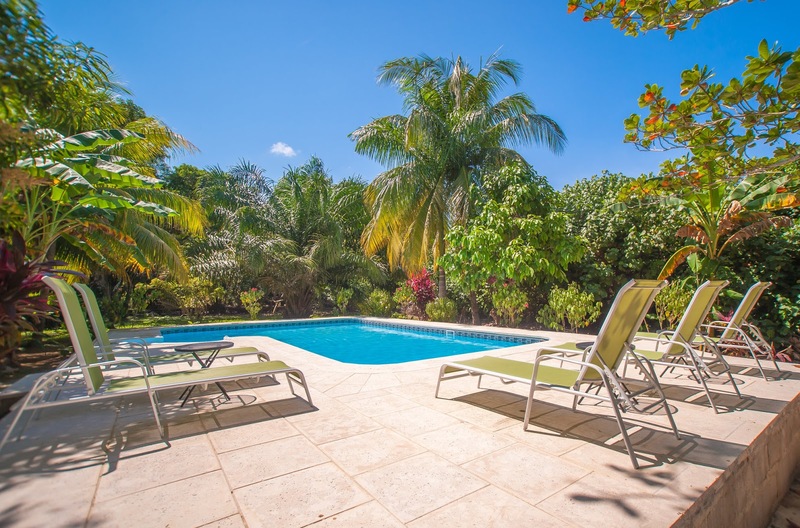 The backyard and the side yards of the property are surrounded by a tropical forest preserve, land that can never be developed. This is what drew us to the property but truth be told, I actually liked another villa at Palmetto Bay better. It was priced much less and was in an area surrounded by other houses with no extra land as a buffer. Being the social person that I am, I like having neighbors that I could see. 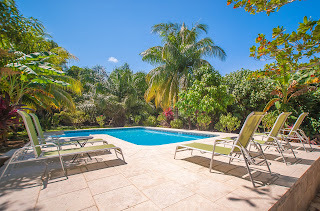 However, as my husband, daughter and real estate agent, Marisol, pointed out, when I craved other company, I could always go to the bar, beach or community pool at the resort.So we bought the villa on the big lot so we could put in our own pool. 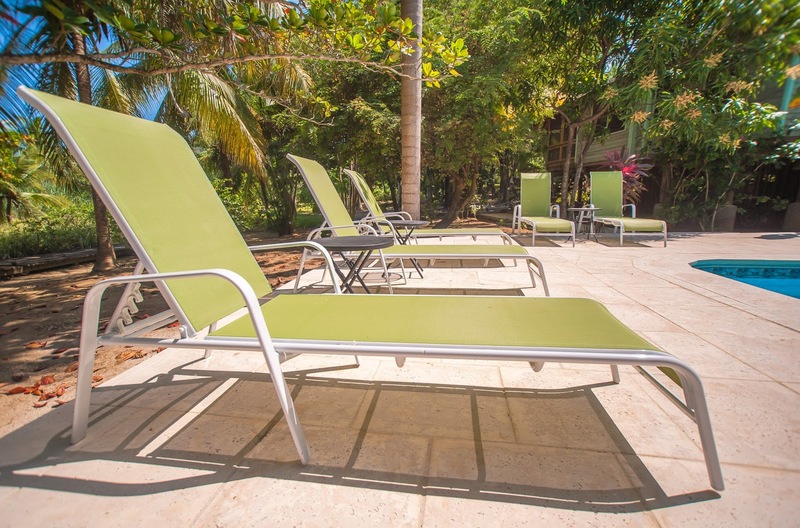 With labor being so much cheaper in Roatan than the states, we figured we could afford it sooner rather than later. Our backyard and the perfect place for a pool. The beautiful palmetto palm that would stand at one end of the pool. So we spoke to our great management team, Heather and Clay, who also happen to be in construction, to set the wheels in motion. The schedule was for the construction to begin over the summer which is typically a slow time for rentals. Also, we were told that it would take about 3 weeks. Of course, I should have realized that was island time and I would have to convert to real time, which turned out to be more like 3 months. Since we live in a resort governed by a homeowners association, we had to submit a design and proposal. Our contractor/manager did that for us and once we got approval, we were good to go. Of course again, being on an island, everything has to be shipped in so there was a delay waiting for the pool parts to come from the US. Lucky for us, when we were there in July getting the villa put together, see renovation part 1, 2, and 3, the contractor staked out the pool and deck for us. It gave us an opportunity to better visualize the pool and decking and made us realize we needed a bigger pool deck. So it was re staked to our satisfaction. 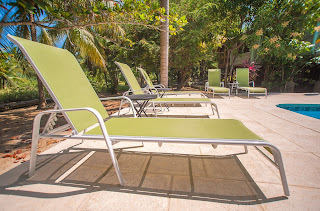 Also, while there in July, we were able to pick out the stone for the walkway and pool decking, and order the chaise lounges and small tables for the pool deck. We had some friends from home staying in our villa during the initial stages of construction so I warned them about the noise, especially since the workers liked to start early, 6am early. I didn't need to worry because again, no big machinery was on site, as we are on an island and what big equipment there is, is very expensive. The daily reports and cell phone pictures from Dawn and Steve showed most of the work being done by hand. Well, the pool is finally done and it looks beautiful. 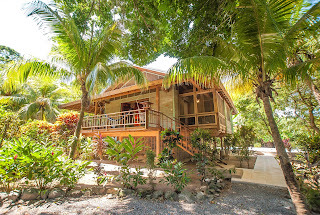 It is so private, surrounded by the nature preserve. The almond tree and palmetto palm offer pockets of shade at each end of the pool during the hot afternoons. We can't wait to go back and enjoy our secluded oasis.